In the city of Salta, on June 6 and 7, PANORAMA MINERO Magazine organized the 7th International Seminar “Lithium in the South American Region”, with the attendance of 620 people including the presence of the diplomatic corps of different countries, national, provincial and municipal officials, members of COFEMIN, mining chambers, national and provincial suppliers of goods and services, consultants and members of study centers. The 7th International Lithium Seminar in the South American Region had a total of 24 technical presentations, including 11 mining companies with projects in different development stages, as well as new uses and applications of lithium, also as the present and future of this metal’s demand and supply. In addition, a keynote address by Joe Lowry, one of the most renowned international experts as far as lithium is concerned. The VIII edition of the International Seminar “Lithium in the South America Region” will be held in June 2019 in the city of San Salvador de Jujuy. 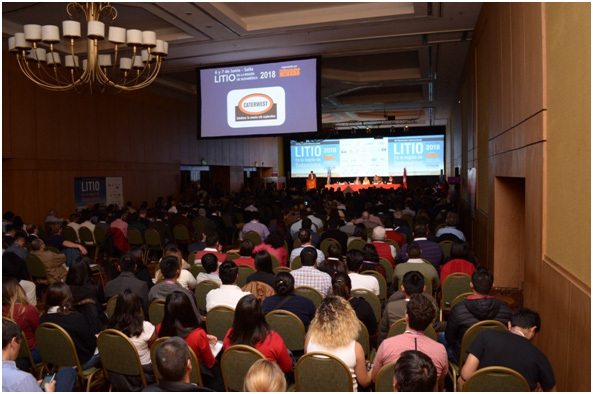 Be the first to comment on "The 7th International Seminar “Lithium in the South America Region” convened 620 people"